Should it be two days, three hours and five minutes, or two days, three hours and six minutes? Your OC tendencies are showing. Haha, thank you for the update! Whoops forgot to clarify! There won't be another full moon on Friday the 13th until 2049. T-two days, three hours, and five/six minutes?!!?? You guys must love ringing our hearts out. Thank you so much for the update ^^ really really thankful!!! Thanks for the new Cheese release! It is hard to wait for the next release, but an extra minute probably won't kill us (we might be pulling our hair and wringing our hands and watch the clock like crazy, but we'll live) :D Thanks so much, Oddsquad, for all your hardwork! Damn cocktease. Of course we want it two days, three hours, four minutes, and 59 seconds. On a sidenote, really appreciate your hardwork! The rabid fangirl game is strong with Sang Chul and Kyang Hwan. Ha! Can't wait for the next chapter, great job as always guys. Thank you! Finished "catching up" to (aka devouring) this amazing manhwa yesterday and I already can't wait for more--this is definitely a new fave. Thank you so, so much for all your hard work translating. You guys are amazing. Thank you for the new chapter, but that cliffhanger!!! 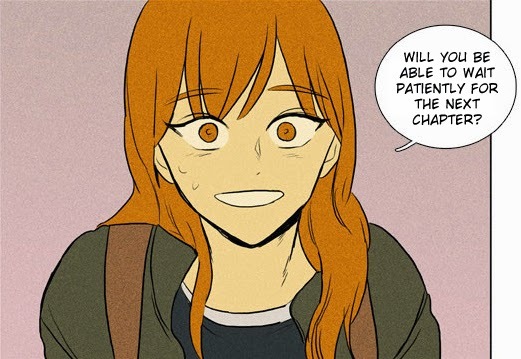 ...I mean who do I have to end to get the next release as quickly as possible?...heh heh joking...human beings are more important than webtoons.....:: chokes on the lie :: JK, I'll wait patiently. I love you guys. I love you guys like a baby loves its mother. Or a mother loves its baby.